The Bay Area boasts two of the northern-most California least tern breeding colonies in Alameda and Hayward, along with a few smaller colonies all the way to Sacramento. 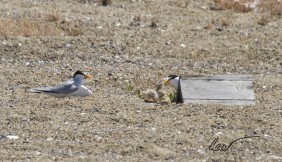 Alameda and Hayward also host two of the largest nesting colonies for the least terns north of Ventura County. Small enough to fit in your cupped hands, adult least terns travel to our area, as well as to other widely scattered nesting colonies along the coast between here and Mexico, to set up their summer nesting colonies. Their winter territories aren’t well known, but it’s suspected they migrate south to the coasts and islands off central and northern South America. These small birds survive on baitfish, such as anchovies and silversides, which they catch by diving headfirst into the water. They remind me of tiny kites hovering and diving into the bay, flying back out with glinting fish in their beaks. It takes a lot to establish and maintain these protected breeding areas. 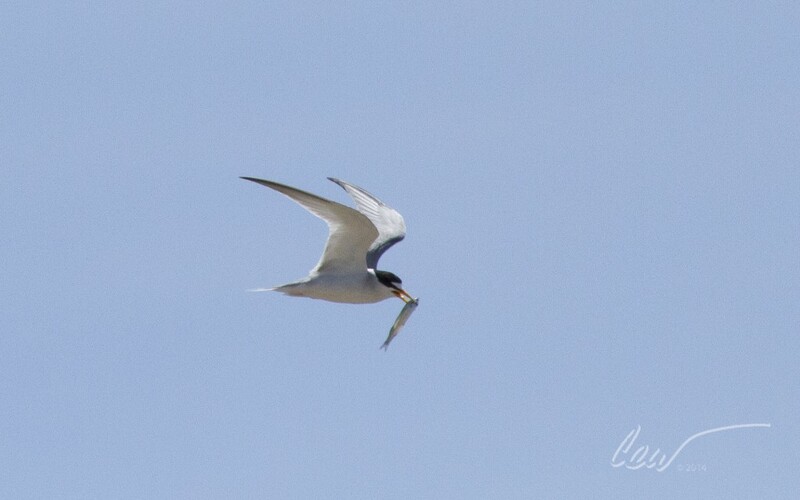 As ground nesters, least terns have many bird and mammal predators. I recently talked with Dave Riensche (affectionately known as “Doc Quack”), the East Bay Regional Park District's (EBRPD) wildlife biologist who manages the Hayward colony, and Susan Euing, wildlife biologist with the US Fish and Wildlife Service (USFWS) who monitors the Alameda Point colony. Alameda has the larger of the two colonies, first noticed in 1976 when the Navy was still actively landing planes in the area. The Alameda colony is having a great hatch year with 78% success rate, up from an average of 72% over the last 7 years. The colony’s success is attributed to intensive predator monitoring by a large group of volunteers along with favorable fishing conditions. The open bay habitat surrounding Alameda provides a diversity of small fish for the adults and chicks. The Hayward colony is newer, established in 2001 on an island in the Hayward Marsh complex, and monitored and maintained by EBRPD with a dedicated volunteer effort. 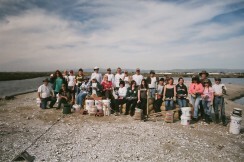 EBRPD colony caretakers undergo a year-long training commitment with a minimum of five shifts. They work in pairs and monitor for predators on the colony. Riensche noted that this year they’re experiencing an astounding 90% hatch rate and have 112 fledglings so far. The Hayward colony provided a great secondary nest site in 2012 when predation at Alameda Point from a variety of raptors, from American Kestrels to Peregrine falcons, drove many terns to re-nest there. Both colonies manage for weed control during the non-nesting time of year and import gravel and oyster shells to maintain the nesting substrate and camouflage least terns require. Both colonies can use volunteers and donations to continue their good work.